Automakers may be paying a lot of attention these days to making their crossovers and SUVs drive more like cars, but at the same time, they're also making cars that feel more like SUVs. 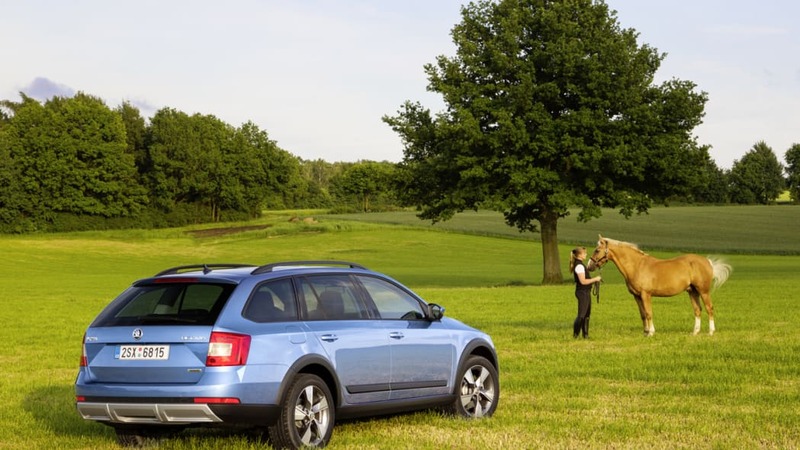 We're talking about models like the Subaru Outback, Audi Allroad and Volvo XC70. These soft-road (if not quite off-road) wagons have a particularly keen following overseas, and that point is not lost on Volkswagen. In fact the German auto giant has soft-road models under each of its mainstream brands: Volkswagen calls it Alltrack, Audi has Allroad, Seat recently introduced the X-Perience version of its Leon wagon and Škoda offers higher-riding, more rugged versions of its wagons which it calls Scout. And here is the latest one. 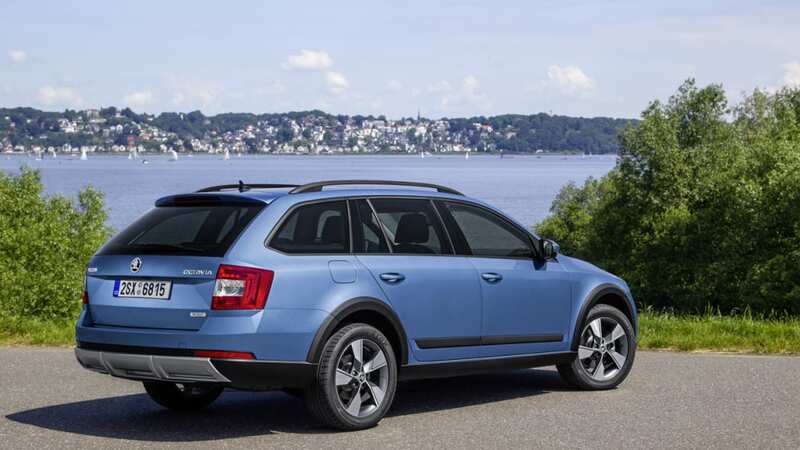 The new Škoda Octavia Scout is based on the same MQB platform that underpins the VW Golf, Audi A3 and Seat Leon. Starting with the Octavia Combi wagon, the Scout adds a Haldex-5 all-wheel drive system with an locking electronic differential and more rugged lower body cladding including a new front bumper with metallic insert, fog lights, black lower door panels and wheel arches. It rides on 17-inch alloys mounted on a suspension jacked up an extra inch, and the interior has been redone to match the more rugged outwards appearance. 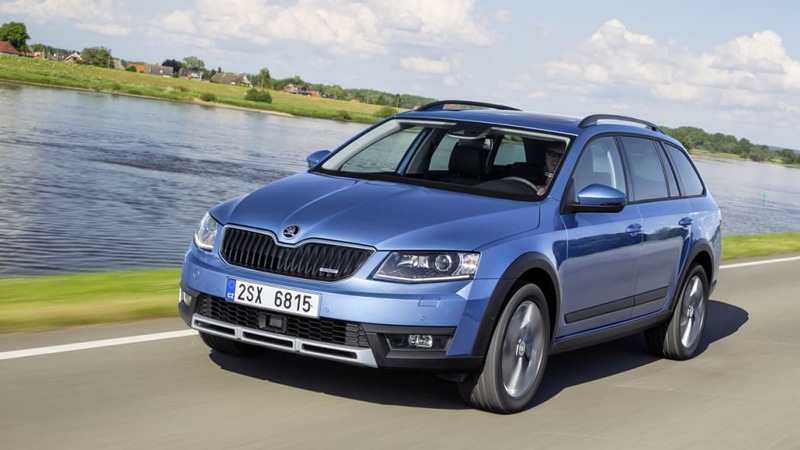 Although the Octavia Scout, like the rest of the Škoda range, will not be sold in North America, around 8 percent of Octavia wagon buyers overseas opt for the Scout version – totaling around 53,600 units sold between its introduction in 2007 and the end of 2013. With the new model, customers will be able to choose between three engines, including a 1.8-liter turbo four with 180 horsepower or a 2.0-liter TDI with either 135 or 184 hp. Scope out the full details in the press release and the b-roll footage below. ​Hamburg/Mladá Boleslav, July 2014 – The new ŠKODA Octavia joins the scouts. The unique all-rounder impresses with its outstanding driving performance even on rough roads, its powerful all-wheel drive and robust off-road look. At the same time, emission and consumption levels have been reduced by up to 20 percent compared to the previous model. In addition, this crossover vehicle is extremely spacious, highly practical, has up-to-date safety and comfort systems and represents excellent value-for-money. 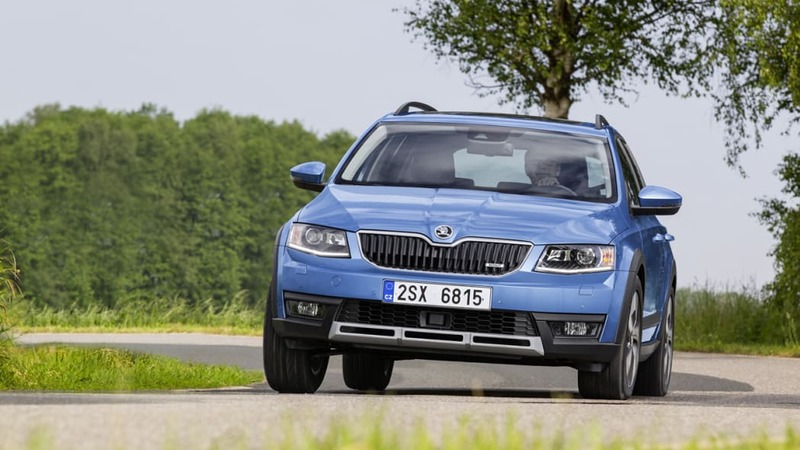 ​"As an exceptionally versatile cross-over estate, the new ŠKODA Octavia Scout demonstrates the strengths of the ŠKODA brand," says ŠKODA CEO Prof. Dr. h.c. Winfried Vahland. "A true Scout has to earn that name at ŠKODA. The Octavia Scout has a rugged character with outstanding all-wheel and steep-slope performance, traction capacity and ground clearance. The car meets the highest technical, aesthetic and lifestyle standards. More and more customers ask for cars with individual appeal and the new ŠKODA Octavia Scout is the answer," says Prof. Dr. Vahland. The new Octavia Scout is available exclusively based on the Octavia estate variant. Its market launch will be in August 2014. The Octavia Scout has been a fixed feature in ŠKODA's model range since 2007. With its second generation Scout, the Czech manufacturer intends to build further on the successes of these versatile vehicles. Between 2007 and the end of 2013, ŠKODA sold around 53,600 Octavia Scouts worldwide. This represents almost 8 percent of all Octavia estates supplied during that period. 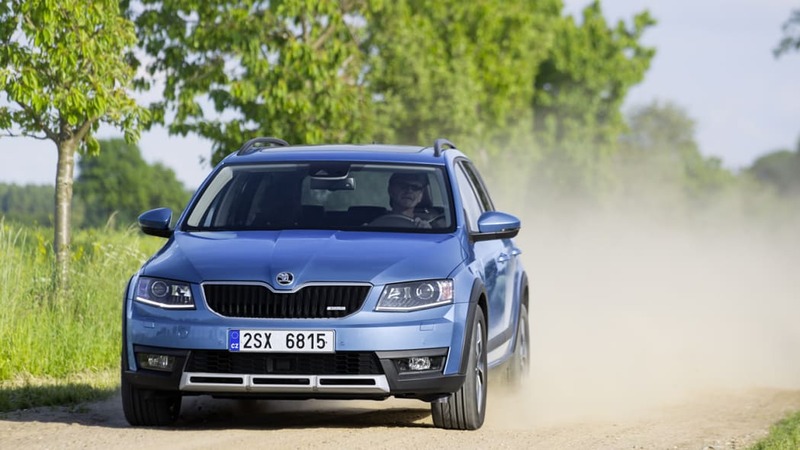 With the new Octavia Scout, ŠKODA once again displays its great expertise in equipping vehicles for off-road capability. 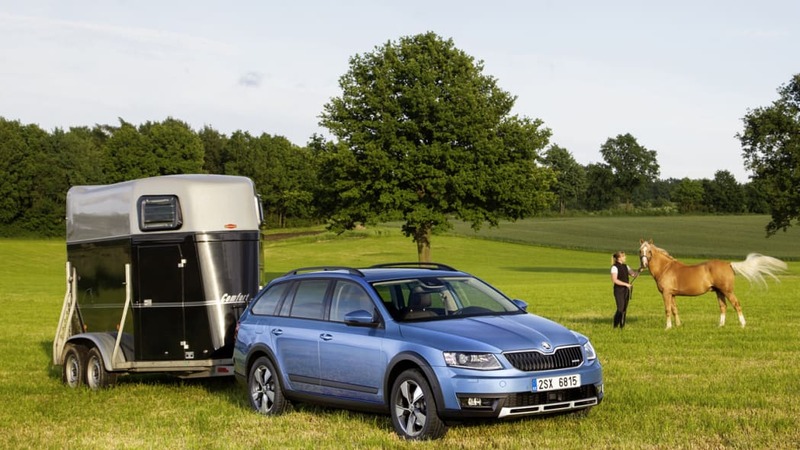 With the models Octavia Scout, Fabia Scout, Fabia Combi Scout, Roomster Scout, Yeti Outdoor and Superb with the Outdoor package, the Czech car manufacturer currently offers six models with special off-road styling. 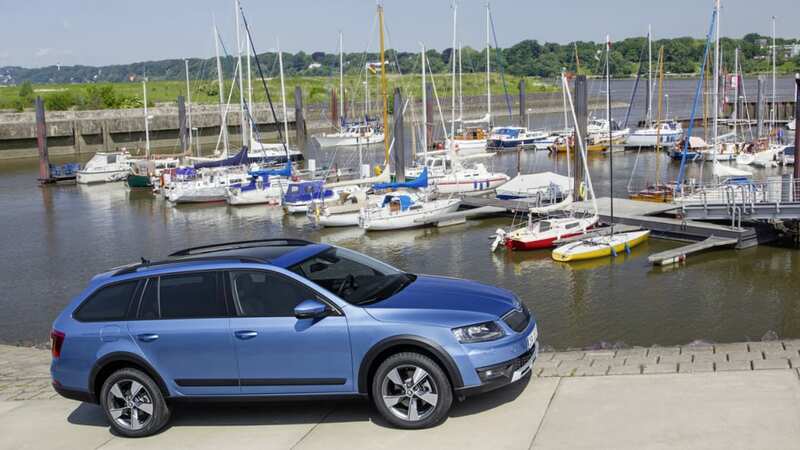 The new ŠKODA Octavia Scout is a vehicle with a style all of its own – self-assured and distinctive. "The Octavia Scout has character: its striking looks and all-wheel-drive technology are in perfect harmony," says ŠKODA Head Designer Jozef Kabaň. The front has a distinctive, Scout-specific bumper with black plastic moulding. The lower front panel has a silver off-road attachment. The fog lights with their sharp, distinctive shape are an exclusive Scout design. 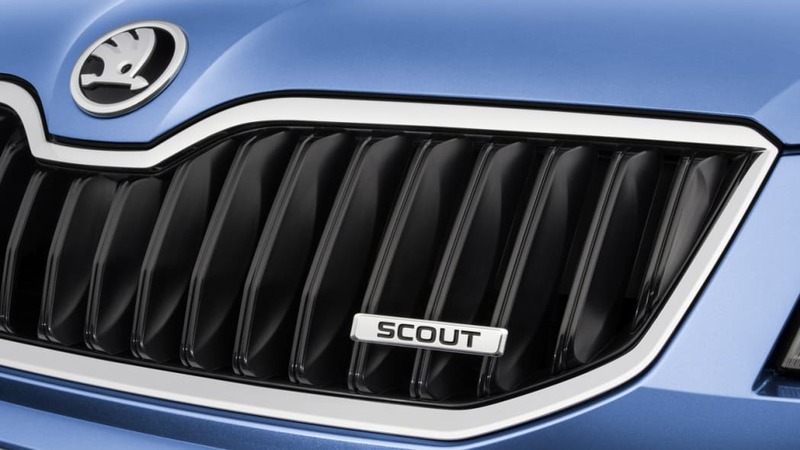 The radiator grille bears the Scout badge. Black plastic door sill and wheel arch mouldings run down both sides of the vehicle and are a distinctive feature of its side view. There are also protective side strips in black plastic, and aluminium-design exterior mirror housings. Aluminium-effect roof railings are available as an option. The ground clearance of the new ŠKODA Octavia Scout has been raised to 171 mm and is now 31 mm higher than the standard Octavia. The rough-road package with additional underbody protection is a standard feature. 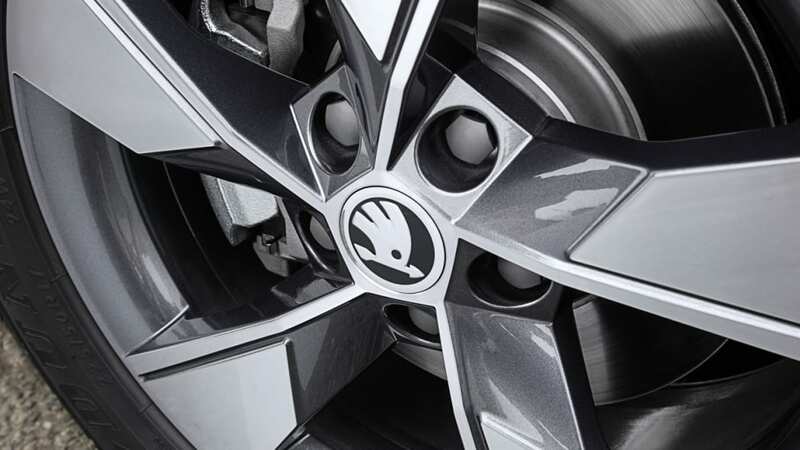 17-inch alloy wheels with 220/50 R17 tyres are also fitted as standard. The rear of the ŠKODA Octavia Scout is precision-designed with clean, uncluttered lines. Two reflectors are integrated into the right and left of the bumper (cat's eyes). 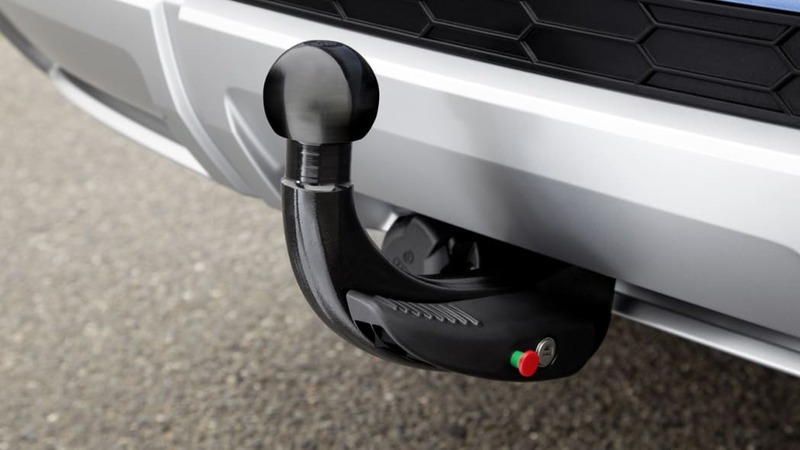 The lower black-clad bumper components include a silver-coloured off-road attachment in the middle. 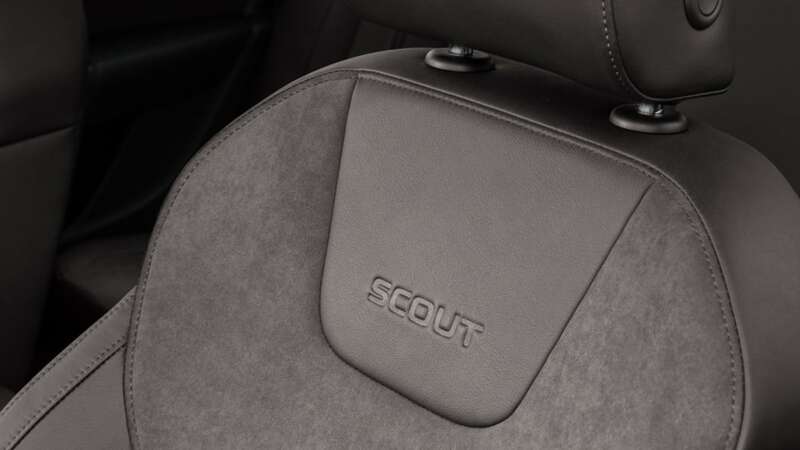 The interior has been specially designed for the Scout. The door sills bear the Scout lettering and the trims are in a unique Scout design. 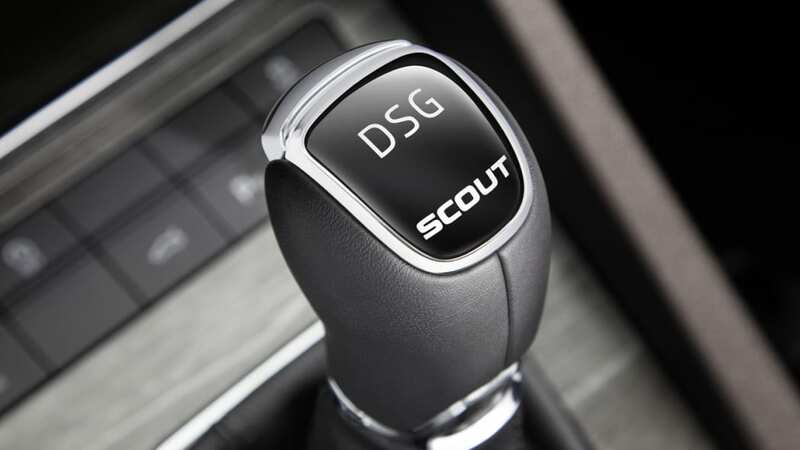 The 3-spoke steering wheel and the gear knob also bear the Scout emblem. The dashboard is available in either the classic black or black/brown combination. The seats are available in either brown fabric or in leather/Alcantara combination (brown or black). 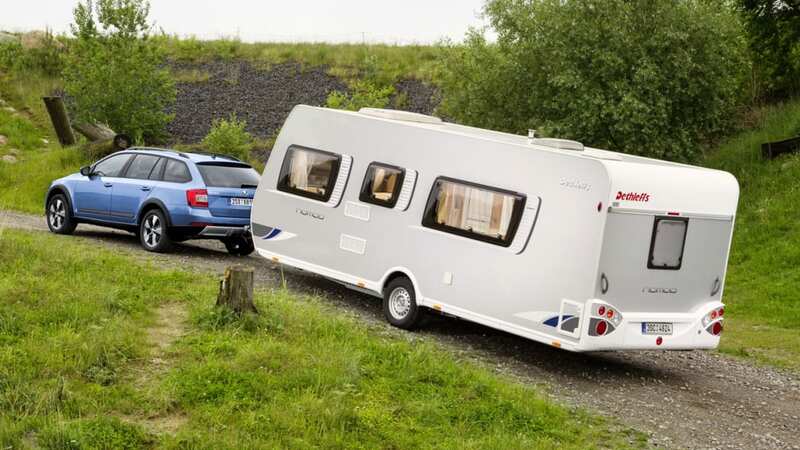 The Octavia Scout is as spacious as the Octavia Combi. The passenger compartment is one of the largest in its class, with optimised interior length (1,782 millimetres), rear legroom (73 millimetres) and headroom at front and rear (983 and 995 millimetres). The boot has a 610 litre capacity, and, with the rear seats down, its capacity increases to 1,740 litres. With the front passenger seat folded down, items up to 2.92 meters in length can also be accommodated. The Scout also has a series of 'Simply Clever' features such as the double-sided floor cover in the boot, the folding cargo fasteners, the ice scraper in the fuel filler flap, the high-visibility vest holder under the driver's seat, waste compartment in the side door and an array of storage compartments. 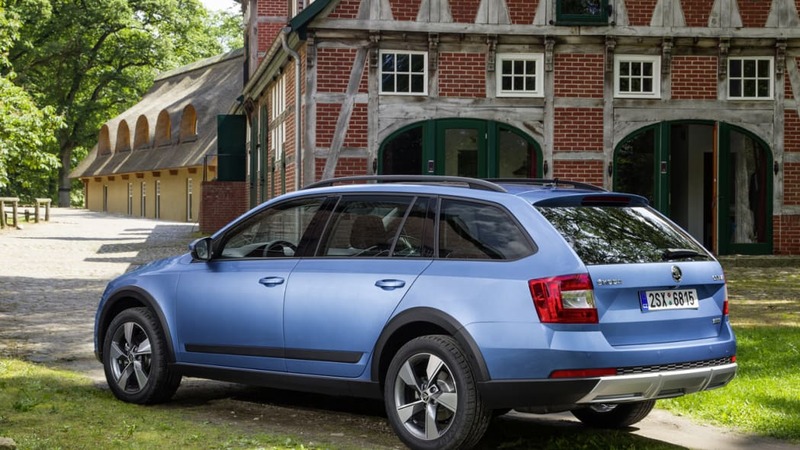 The ŠKODA Octavia Scout is available in the entire Octavia exterior colour range: four standard colours (including the new colour Laser White) and nine metallic colours. The Octavia Scout is available exclusively with all-wheel drive. Optimum drive capabilities and traction are guaranteed by modern all-wheel-drive technology based on the Haldex-5 clutch. The distribution of power to all four wheels changes depending on the conditions. Ideal driving torque for the rear axle is constantly being calculated. Compared with the Haldex-4 clutch previously used in the Octavia Scout, the new technology is 1.4 kg lighter. 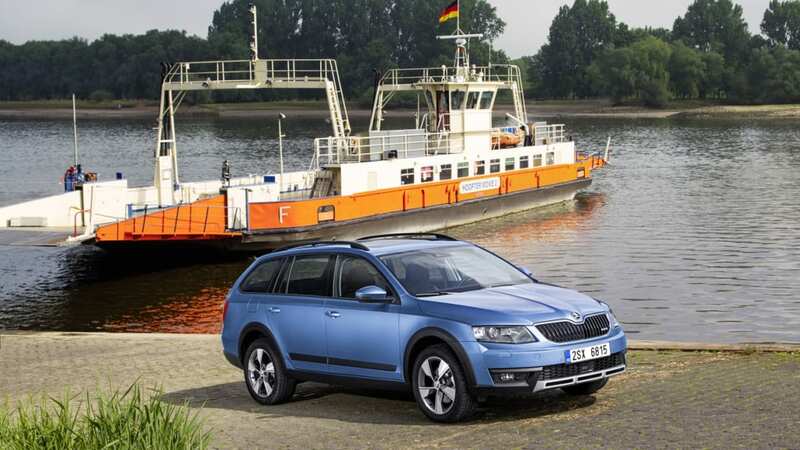 The ŠKODA Octavia Scout is a real workhorse and can tow up to two tonnes, 25 % more than before. It also has excellent steep-slope capability. With greater angles of incline from 16.7 degrees at the front and 13.8 degrees at the back, the Czech scout can also master steeper, more demanding terrain without difficulty. Electronic differential lock (EDL) supports stable start-up characteristics at low speeds in the Octavia Scout. The new Octavia Scout features a two-stage Electronic Stabilisation Control (ESC). 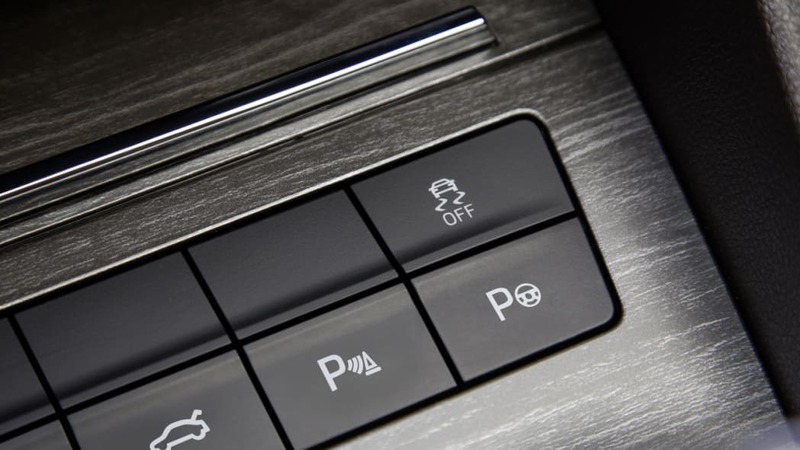 The system can be adjusted to suit certain driving conditions at the touch of a button. The new ŠKODA Octavia Scout has three engines to choose from: two diesel and one petrol. The engines are both more powerful and more economical than those used in the previous model. Yet they are still up to 29 kg lighter. All engines feature improved all-wheel-drive technology and the use of efficient Green tec packages with automatic stop-start mechanism and brake energy recovery as standard. All three engines meet standard EU 6 which comes into force in September 2014. The most powerful diesel engine is the 2.0 TDI/135 kW (184 PS) with an attractive combination of an automatic six-speed dual-clutch transmission (DSG) and all-wheel drive. This is the first time that the engine has been used in this configuration in a ŠKODA. The combined fuel consumption is only 5.1 litres/100 km with CO2 emissions of 134 g/km. The 2.0 TDI/110 kW (150 PS) is available exclusively with a manual six-speed gearbox. The engine manages 5.1 litres/100 km with a CO2 emission value of 129 g/km. The Octavia Scout is available as a petrol engine with the 1.8 TSI/132 kW (180 PS) with automatic six-speed DSG. Combined consumption is 6.9 litres/100 km with CO2 emissions of 158 g/km. The safety technology of the new ŠKODA Octavia Scout sets the highest standards. Up to nine airbags and state-of-the-art 3-point seatbelts protect the occupants in the event of an accident. Furthermore, a wealth of new safety features are available as optional extras: Front Assistant with emergency braking function, Lane Assistant, multi-collision brake with automatic braking in the event of an accident, Crew Protect Assistant for vehicle safety in crash situations and Driver Activity Assistant (fatigue recognition). Thanks to its modern chassis with optimised axles, the new ŠKODA Octavia Scout impresses with excellent vehicle handling in almost every situation. It has an optimised multi-link rear axle. The MacPherson strut at the front with low-mounted triangular wishbones has shed around 2.8 kg compared to the previous model. In addition, a range of electronic comfort systems are available for the new Octavia Scout: Adaptive Cruise Assistant (automatic distance control), Intelligent Light Assistant, Automatic Parking Assistant and Traveller Assistant with traffic sign recognition. Another optional feature for the new Octavia Scout is KESSY (Keyless Entry Start and Exit System). 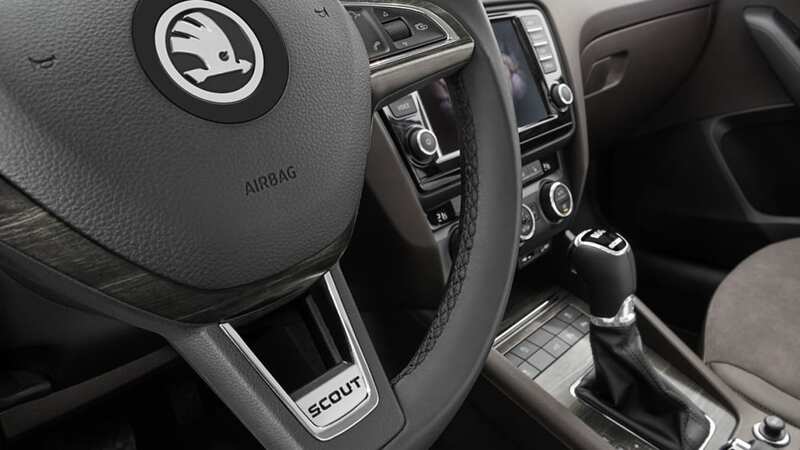 The vehicle can, in addition, be supplied with Optical Parking Assistant (rear-view camera) and a 3-spoke multifunction leather steering wheel in Scout design. The Swing radio now has a 5" colour touch display.